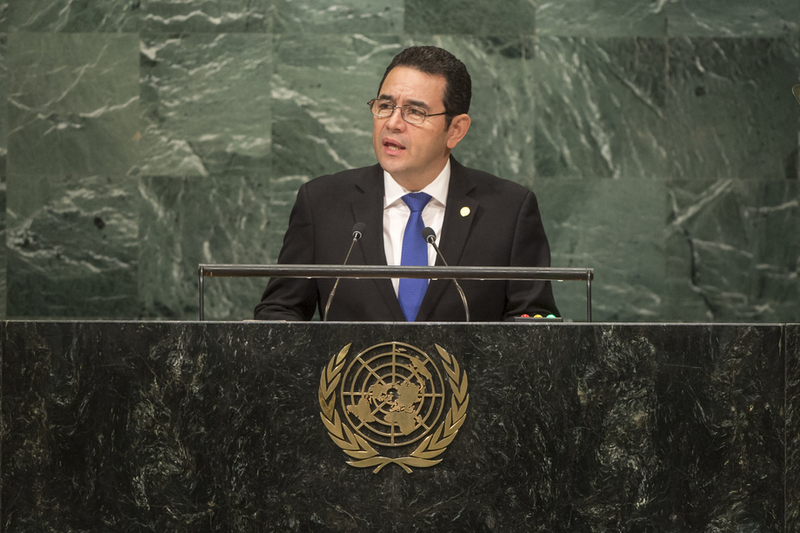 JIMMY MORALES, President of Guatemala, recalled the Esquipulas Peace Process and the signing of the Procedure for the Establishment of a Firm and Lasting Peace in Central America. The peace accords included a ceasefire and reforms. Those reforms have greatly advanced development in Guatemala, benefiting vulnerable groups such as indigenous peoples and women. As a result of the peace processes, the rule of law had also been strengthened. The election of the new Government was an expression of the discontent among the population, he said. A reconstruction of society was required, and transparency in governance, health care, education and development had to be improved. He emphasized his commitment to zero-tolerance for corruption. Corruption weakened institutions and hampered development. The Government had made primary education and the effective management of hospitals, nutrition and maternal health a priority. Challenges in the areas of human rights and climate change remained. His Government sought to engage further with the Human Rights Council to address those challenges. He expressed his profound admiration for migrants in Guatemala and their hard work. Migrants were model citizens and their rights and human dignity must be respected. The Government was adamant about their protection during all stages of migration. With regard to the 2030 Agenda, he noted that it was in line with the country’s 2032 K’atun National Development Plan. He also called for strengthened international dialogue and cooperation to prevent future conflicts in the region. Attacks and violence undermined trust. He stressed the need to maintain peace in the region and to strengthen the rule of law. Guatemala would continue to support United Nations peacekeeping missions worldwide and remained concerned about the ongoing conflicts in Syria, Mali and Sudan. The representative of Guatemala responded to references made by Belize to a 150-year-old territorial dispute, reiterating his country’s peaceful commitment to a permanent resolution of the dispute that both countries had inherited and its aspiration to ongoing dialogue. Guatemala had never resorted to or threatened the use of force, he said, adding that, on the contrary, it had always sought to settle the dispute through peaceful means and to reach a mutually beneficial solution. Guatemala recognized the independence of the people of Belize, but it had historical rights to part of that country’s territory, which had been taken away through deceit. Today, a new kind of violence was taking place, he said, recalling that during the last decade, its victims had been defenceless Guatemalan farmers on Belizean territory. The violence against them was a moral aberration and their deaths had gone unpunished, he said, adding that the last victim had been a 14-year-old boy who had died at the hands of Belizean military personnel. Such irrational conduct was not legally justifiable and the legal report on the incident had not justified Belize’s behaviour. Guatemala would continue to seek a just solution and would submit the matter to the International Court of Justice in order to avoid further attacks that would be harmful to both nations, he said.